Rangefinder aficionados never talk about the Leica M1. You’d think they would, given it’s the first in the iconic Leica M series, right? They don’t because it’s not. 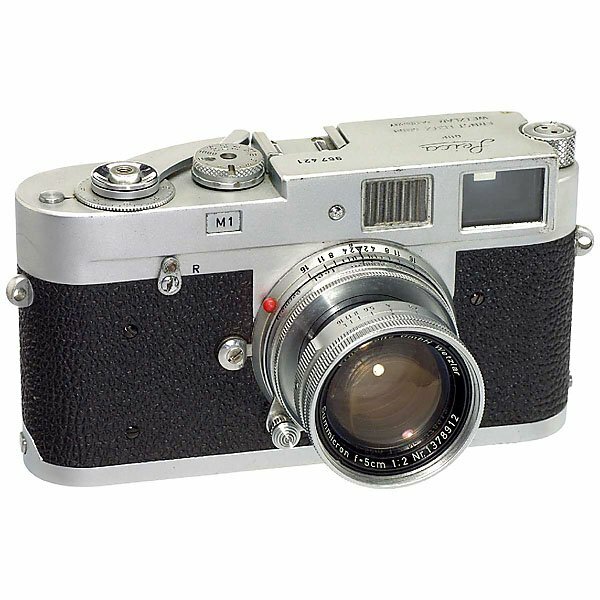 It was first offered for sale by Leitz in 1959, 5 years after the original M, the M3*, and also after the MP (1956) the MP2 (1958) and the M2 (1958). And it’s not even a rangefinder camera, because it’s got no rangefinder. The M1 is a simplified M2 intended to be used for medical and scientific work when coupled with the Visoflex. (The Visoflex is a mirror reflex housing that turns your Leica M into a single reflex camera.) So the M1 is essentially an M2 with a viewfinder but without a rangefinder. As such, it’s pretty much useless as a portable Leica, although you certainly can attach an ultra-wide angle optic (a 21mm Angulon, say) with external viewfinder and use it while zone focusing. Bottom line: you don’t want an M1. * The question becomes, then, why Leitz numbered the M series issues in the way they did. Why the M3, then M2, then M1….then M4? As best I can figure, the initial M was christened the “M3” as opposed to the “M1” because the existing Leica at the time of the M3’s introduction was the screw mount Leica III (more specifically, the IIIf, pronounced the “Leica Three F”). I assume the initial M was designated as an “M3” both for continuity (“three”) and differentiation (“M”). This entry was posted in Leica M1 on March 28, 2016 by Leicaphila.